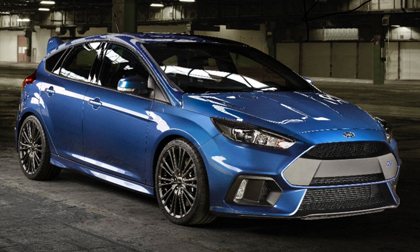 DEARBORN, Mich., Jan. 14, 2016 – Ford Motor Company will auction a custom 2016 Ford Focus RS for charity at the 45th Anniversary Barrett-Jackson Scottsdale Auction in Scottsdale, Arizona. Proceeds will benefit JDRF, the leading global organization funding type 1 diabetes research. JDRF has invested nearly $2 billion in research over the past 45 years and is sponsoring scientific research in 17 countries worldwide. Live coverage of the auction of the Focus RS will air on Velocity on Saturday, Jan. 30, at approximately 7:30 p.m. The winning bidder of Barrett-Jackson Lot #3009, selling at no reserve, will become the owner of a custom 2016 Focus RS. Unveiled at the 2015 Frankfurt Motor Show, the all-new Focus RS takes years of Ford engineering and performance to new levels, making use of advanced performance features and selectable drive modes – including Ford-first drift mode and launch control. Team members involved in the car’s design and development, along with professional rally driver Ken Block, will be on stage to ramp up excitement among bidders, fans and TV viewers. Focus RS is powered by a 2.3-liter EcoBoost® engine that sends 350 horsepower and 350 lb.-ft. of torque to all four wheels simultaneously. Unlike any other vehicle Ford has developed, Focus RS comes standard with a unique six-speed manual transmission and Ford Performance All-Wheel Drive with Dynamic Torque Vectoring. Other features include a set of 19-inch premium painted alloy wheels wrapped in performance Michelin Super Sport tires, unique RS front fascia and grille, distinctive headlamps and fog lamps, redesigned rear wing for added downforce, and RS sport exhaust with dual bright tips. Interior touches such as the blue RS rally theme throughout, partial-leather Recaro sport seats, alloy racing pedals and performance gauges complete the high-performance styling. In addition to the latest Ford Performance models, Ford will have its full 2016 vehicle lineup on display, including the new Explorer and F-150 as well as all-new Lincoln sedans and SUVs. Throughout the nine-day event, auction-goers will have the opportunity to get behind the wheel of their favorite Ford models for on-site ride-and-drives. Ford auction information, visit the Barrett-Jackson website or Facebook.